This headland is located between Palm Beach on Greville Avenue, and John Williams Reserve on Sanctuary Point Road. This area has been registered by the Sanctuary Point Bushcare Group, as an area of “Remnant Bushland”, and is regarded as a vital reserve for flora & fauna. 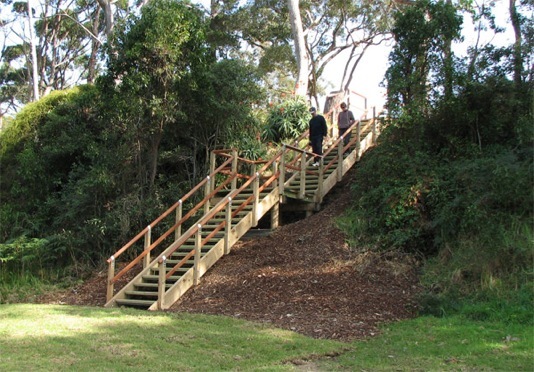 In July 2008, Council completed construction of stairway enabling access from the John Williams Reserve end, up to the Redhead Point area. Shoalhaven City Council assessed options with regard to access and future maintenance. The Forum is looking forward to timely consultation with staff in regard to the future management of the site. Access and the future ongoing maintenance are issues that need to be discussed. The Forum unanimously supported the proposal that dogs are prohibited for this reserve because it abutts a dogs prohibited area ie Palm Beach so there is no point in allowing dogs in this reserve. The Forum also supports the retention of the remnant vegetation on this site. Please let us know if you have any issues that you would like to raise in regard to the future management of this area.